There has always been an intense amount of interest around the assassination of President John F. Kennedy and with good reason. It was a horrific event in which the President was murdered in front of countless people with any number of possible suspects, there was a race to get Kennedy to the hospital, the immediate man hunt for the suspected shooter and countless other avenues were followed that fateful November day. What writer and director Peter Landesman has attempted to do, in his directorial debut no less, is condense these events into a feature that runs a mere hour and a half long (including notes at the end and the credit sequence). There is not nearly enough time here to develop the several intriguing stories the film documents, much less get to know the the actual emotions felt by the people placed under these extraordinary situations. 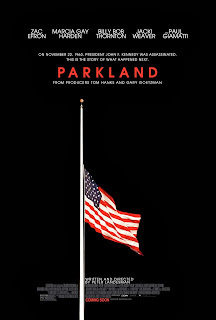 Parkland would be a film that justifies a run time of at least three hours, but it seems Landesman is keen on hitting the high points of these events and highlighting little more than small moments of that day in brief, almost news clip-like segments that intertwine to piece together November 22, 1963 and the subsequent days following as both the President and his suspected killer were laid to rest. I am a sucker for historically-based films and have read plenty on the JFK assassination, the investigations around this event and the countless conspiracy theories that continue to plague it nearly fifty years after it occurred. I also know better than to get my history lessons from the movies and so I approached this film with a sense of both optimism and caution as it seemed both ambitious while at the same time a balancing act of moments pulled straight out of the history books with little more intention that bringing to life how this death affected unsuspecting, regular citizens while adding nothing more to the story and having no particular point of view it was going to approach the subject matter with. Unfortunately, while the actual events of that day remain engaging as ever Parkland is only able to take us so far because it only gives its content so much attention before moving on and taking the audience, no matter if we have lingering questions or deeper interests, with it. I can admire the film for what it is trying to do and the dots its trying to connect, but ultimately this is more a failed experiment than anything else with an execution that doesn't come close to what it promised. Parkland Memorial Hospital after he was shot on November 22, 1963. While I expect a certain amount of engagement with inherently intriguing material such as this, my most obvious issue with this film was the fact it never connected with me, it never felt like it held the weight of the seismic events it was discussing. It was as if I'd been debating religion or love with a person who had an opposing view but left no impression on me because they didn't know how to best formulate their thoughts. It is almost unbearably frustrating because you know, despite the lack of cohesion or organization, that there is something there, some kind of potential that in the right hands could be made to be something much more profound or at the very least make a valuable contribution to the ongoing conversation. That is not to say Landesman isn't capable of directing feature films, but he needs an editor or a distributor that will back up from such a large project and say this is going to be a massive film or even better, that this story and the approach you are using might better be suited for a mini-series a la Band of Brothers or others in that vein. I think it would have not only benefited the character development and the overall arc of the film, but it would have allowed the audience to see why these separate stories build so well on top of one another. 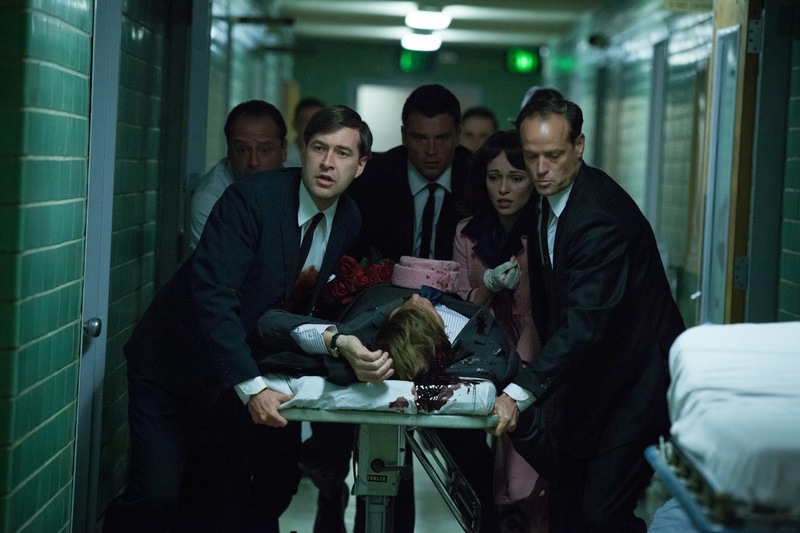 There is genuine tension in much of these scenes, especially those involving the hospital sequences, from which the movie draws its title, where Nurse Doris Nelson (Marcia Gay Harden) and Doctors Charles Carrico (Zac Efron) and Malcolm Perry (Colin Hanks) attempt to revive the President after being taken completely off guard by his arrival and unaware of what had just happened to him during the parade. These scenes are chock full of interesting aspects that if given more time might be afforded the ability to go into more detail and discuss not simply the "how" of what happened on that day, but the mechanics of why things turned out the way they did, the questions the Doctors no doubt had when Kennedy was rolled in and they were asked to operate with no prior knowledge of their patients medical history and the scuffle caused by the fact the President should have been examined by the coroner present at Parkland rather than being flown back to Maryland. Each of these matters are worthy of more time than is devoted to them in the film and that is only one of at least four equally engaging angles from which the film approaches this definitive event. Of the other people documented in the film are Abraham Zapruder (as played by Paul Giamatti) whose video of the assassination would become the most famous home video of all time and was immediately cause for him to be thrust into the middle of this moment in time after being introduced to Forrest Sorrels (Billy Bob Thornton) head of the Secret Service Dallas office at the time. As Sorrels, Thornton displays a presence that is at the same time inherently who he is while immediately conveying the values and personality of what makes this man who he was. We understand his intentions and we trust that he is doing what is in the best interest for what will of course be at the forefront of what people are looking to in order to figure out what exactly happened that day. More than Thornton though, who really did deserve his own hour dedicated to his point of view, is Giamatti. Most have no doubt heard of the Zapruder film even if they are unaware it is the same thing as the JFK assassination footage, but to see the man behind the footage and his unwavering admiration for Kennedy and then the look of horror on his face as he realizes what is happening through the lens of his 8 mm camera, it is astonishing. Giamatti delivers the look of pure shock, the inability to overcome what he has just witnessed and the disgust he feels at almost being responsible for being the window into such a horrible event for the rest of the world. "An undignified end for a very dignified man," he says to Life magazine reporter Richard Stolley (Jeffrey Schmidt) before handing over the rights. To simply see the reaction of Giamatti's Zapruder as he continues to film Kennedy even after hearing the shots fired gives us a glimpse at the chaos, the on a whim nature of everything that followed the shots and how one might be able to continue doing only what you know in a moment of pure confusion. There are also moments in which we are taken in and out of the investigation with James P. Hosty (Ron Livingston) and his boss, Gordon Shanklin (David Harbour), at the FBI offices in Dallas. 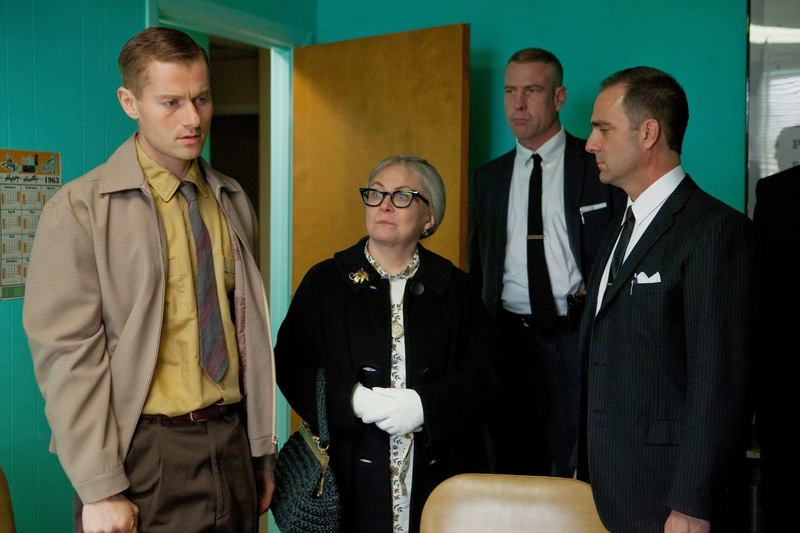 This overlaps well with the storyline including Lee Harvey Oswald's mother Marguerite (Jacki Weaver) and brother Robert (James Badge Dale) who must come to terms with what their family member may or may not have done and how it will forever affect their lives. While the investigation in and of itself could be a mini-series, the ins and outs of what happened that day and Hosty's previous contact with Oswald hardly gets the attention it deserves while the Oswald's extremely different points of view on Lee are intriguing without being in any way informative. who their brother and son were in Parkland. There are countless other familiar faces that show up throughout the film with the likes of Mark Duplass, Tom Willing, and Jackie Earle Haley popping up as both Secret Service agents and a priest that is too late to deliver the last rights to the President. Still, the bottom line here is that this is little more than a cliff notes version of what happened as the world seemed to spiral out of control after the death of one man forever altered the course of countless peoples lives. There are mounds upon mounds of information, characters and interesting facets to explore here, but the film has neither the time nor the patience to sit tight with one individual set of characters or focus on one particular aspect. Now, I understand that the intention of this film was to dramatize the chaotic events that occurred at Dallas' Parkland Hospital on the day U.S. President John F. Kennedy was assassinated. I get that and I understand it likely did this in the most efficient way possible while holding a consistent tone and tension throughout. To a large degree, it does this with a fair amount of competency that engulfs the audience in its proceedings, but it leaves us yearning for more and not in a way that is necessarily satisfactory. While I understand the intention of the film and that it might have accomplished that in some sense, what it doesn't do is to create any type of emotional connection deeper than surface-level with its audience and for any film of almost any genre, that is a defining characteristic. With material such as this it should have been of the utmost importance to make the audience feel the the power, the shock, the chaos of that day, but instead we feel disconnected and familiar with the events only occasionally engaged by what might be a fascinating aspect or character that we may not have been aware of before or wanted to know more about. These promising glimmers of hope soon fade though for as quickly as we are brought into each of these peoples worlds we are taken away and forced to read what became of their lives. 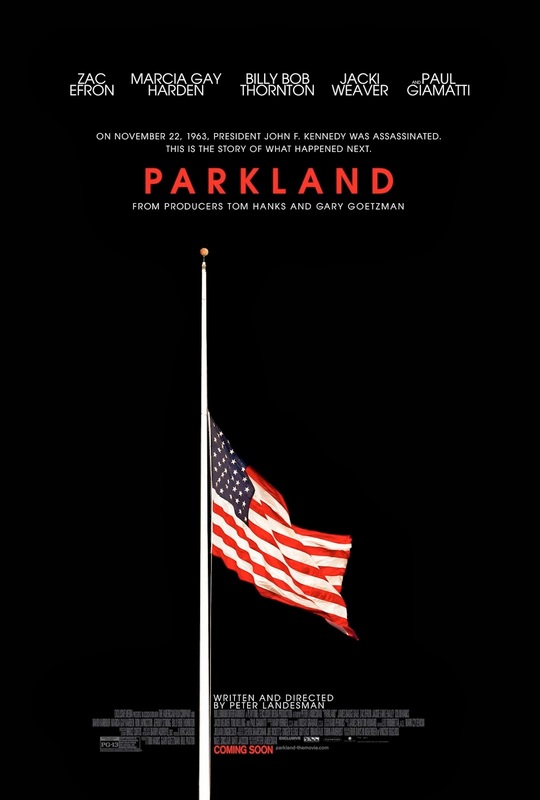 It is a disappointing experience again, because it held so much promise, but if there is one thing to be learned from Parkland it is that there are several more films and TV series waiting to be made about the participants who contributed to this story.